How to select the best type of avocado to grow indoors - AvoSeedo - Grow your own Avocado Tree! Types of avocados trees well suited for growth indoors. Holiday avocados are type A (see ‘pollinating’ section below) dwarf and weeping trees, meaning they are smaller and the branches naturally droop to the ground forming an umbrella-like shape. This tree is named ‘Holiday’ because it produces fruit between Labor Day and New Year’s Day, approximately 12-18 months after blossoming. Holidays may begin to produce fruit anytime between 5 and 13 years and can grow to a height of 10 to 12 feet with mature leaves approximately 8 inches long. Like most types of avocados, they produce every other year. As a Guatemalan variety, Holiday avocados offer deliciously flavored large (18-24 oz.) pear-shaped green fruit. Fruit will ripen in several days and can then be stored in the refrigerator. A benefit of growing your own organic avocados like this is the opportunity to harvest as often as needed, reducing chances for waste. The skin is thick and bumpy. Holiday avocados are hardy and can tolerate temperatures down to -1°C, although this is not recommended. Wertz avocado trees are a type A hybrid cross of Guatemalan and Mexican, growing slightly larger than Holiday trees. This is also a weeping tree with densely packed limbs and leaves. The fruit (10-20 oz.) is flavorsome with a medium-thick green peel that remains green when ripe for harvesting. After approximately 8 to 20 years, the tree will begin producing fruit between May and September. The tree in full size is about 8 to 12 feet. Wertz are somewhat hardy, withstanding periods of cold temperatures similarly to Holidays. Gwen avocado trees might be slightly better at fruiting indoors. Guatemalan type A dwarfs grow to 14 feet high, fruiting between February and October. Similarly to Wertz, the medium-thick skinned fruit (6-15 oz.) is green and remains green when ripe. Gwen avocados are also hybrids growing 8 to 20 years before producing fruit. Gwen has a higher yield than Hass avocados, which are popularly sold at supermarkets. This frost tolerant species can also withstand cold temperatures down to -1°C. Characteristics that commonly improve the growth of Holiday, Wertz and Gwen avocado trees. Growing a pit in water until sprouting is the best method to start growing your avocado tree. When the sprouted pit root reaches 6 to 8 inches, plant it in a grow bag twice as deep as the root and roughly 10” diameter. Grow bags are an excellent way to maintain oxygen at the roots. When transplanting the pit or small tree, be careful to hold it from the bottom because the roots are very fragile. Plant it above the soil level so adding a couple of inches of mulch will match closely to the same height. These trees require good drainage as they are susceptible to root rot, so do not use a clayey soil. Keep the soil moist, but not saturated. In a grow bag, water needs to be maintained to keep enough moisture. You can even periodically apply mist to the tree. When the plant grows taller, it is a good idea to plant a stake in the grow bag to improve stability. Citrus/Avocado food can be used to maintain macro- and micronutrients. During the first year of growth, monthly additions of fish emulsion will support tree growth. Feed twice a year after that. Nutritional deficiencies can occur, so monitor the plant for things like discoloration and pitting. If you notice yellowing leaves, incorporate an iron chelate into the soil. Lots of direct light, even through glass, promotes photosynthesis. 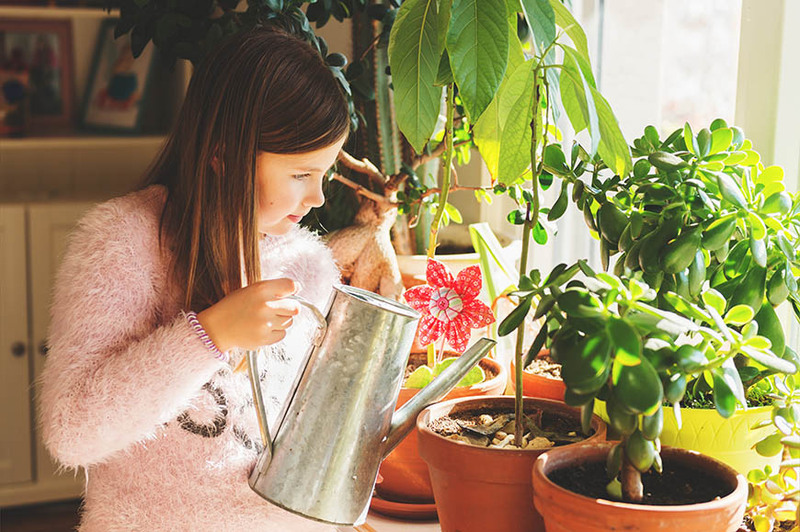 Turning the plant from time to time will help foliage develop evenly throughout the plant. Maintaining a pH around 6 to 6.5 helps these three trees to utilize nutrients. Avocado trees can self-pollinate. However, there are two categories of avocados, type A and B. This indicates the time of days the male and female parts open and close. Type A trees flower from morning to afternoon exposing the female pistol. The following afternoon, the male stamen will open for pollination. Type B trees flower as female in the afternoon until evening and then as male the following morning until afternoon. Pollination must occur while the pistol is viable, so manually pollinating the flower will increase the chances of fertilization. During spring, maintaining mild temperatures may cause flowering to occur at slightly different times of the day, either improving or reducing chances for self-pollination for both type A and B. The benefit of having a type A and type B is they can fertilize each other, since the morning flowering times match for female and male parts respectively. The fertilized ovary becomes the actual fruit. Providing cool nights will help force blooming. Growing indoors can be more successful when incorporating a graft. As previously stated, type A and B plants grafted together may improve opportunities for self-pollination. The three varieties of trees presented in this article will still bear fruit plentifully through self-pollination, even without using a graft. If you wish to incorporate a graft, make a chisel point on a young green sturdy branch known as a scion. For best results, use a donor tree that has previously produced flowers. To graft, make a cut downward into the side of the trunk (less than half-way) on the receiving plant and place the graft within the cut. Use grafting rubber secured with grafting tape to hold it in place, covered enough to keep water from entering the cut and prevent rot. To maintain shape and limit the growth amount, remove extra growth from limb/branch tips. This can also help plants to become bushy and strong. Do not cut too much off the top, as the top 1/3 of the tree is fruit producing. Because of their smaller size, Holiday, Wertz, and Gwen avocado trees will be a much better choice for indoor growth. Pits can be grown in water and transferred to grow bags for growth into full trees. Lots of sunlight and adequate water are important to manage for all three varieties, and generally you don’t have to worry about adding nutrients often. Grafting and pruning can help these type A plants become healthy and more fruitful. Good luck growing your first indoor avocado! This entry was posted in All about Avocados, Gardening and tagged avocado grow bag, avocado tree, avoseedo, grafting, grow avocado indoor, grow bag, gwen avocado, holiday avocado, pollinating, potting, pruning, Wertz, wurtz. Pingback: How to Care for Your Avocado Tree in the Winter - AvoSeedo - Grow your own Avocado Tree!